Pastor Michael Jacobsen, of the Evangelical Lutheran Church in Bavaria, was installed by as FRM Aboriginal Support Worker at Irrultja, Northern Territory, earlier this month by LCA Bishop John Henderson. Pastor Jacobsen will work with Alyawarr-speaking Lutherans in the southern Northern Territory communities of Ampilawatja, Engwala, Alparra, Irrultja and Rocket Range for up to six years. His call to serve with FRM has been the result of a three-year process of talks and prayer, resulting in an arrangement between the German church’s partnership and development mission arm Mission EineWelt, the LCA and FRM. Bishop Henderson described Pastor Jacobsen and his wife Hanne, who is working in administration at FRM’s Yirara College in Alice Springs, as ‘gifts of God to the LCA’. ‘We are extremely grateful for the generosity of the Evangelical Lutheran Church in Bavaria for its support and assistance in not only identifying and calling Pastor Michael to Australia, but for its ongoing provision for his welfare’, Bishop Henderson said. ‘Pastor Michael has demonstrated a real servant heart and love for God and his people. He is already learning the local language, and has readily joined in with the local ministry team. Pastor Jacobsen, who was born in Papua New Guinea to German missionary parents and grew up there, studied theology and was ordained in Germany. He then served in the Evangelical Lutheran Church in Papua New Guinea as circuit missionary in PNG’s Western Highlands from 1987 to 1989, when he returned to Germany for family reasons. He most recently has served as parish pastor in two congregations near Weissenburg, in central Bavaria. He said he had always wanted to follow in his father’s footsteps as a pastor, and particularly as an overseas missionary. ‘Due to my biography, I have always had a wide horizon with my heart beating for the worldwide church of Jesus Christ’, Pastor Jacobsen said. ‘My wife and I understand a pastor’s home as a place open for the wide world. ‘I believe I will be able to apply my experiences of long-lasting parish work for the training of pastors and volunteers of the Aboriginal communities, especially my knowledge of church growth and pastoral care. FRM Board Chair Tim Stollznow said it was the Mission’s ‘prayer and strong belief that Michael’s skills, passion and strong calling, together with his wife Hanne, will be a blessing to this area for many years to come’. 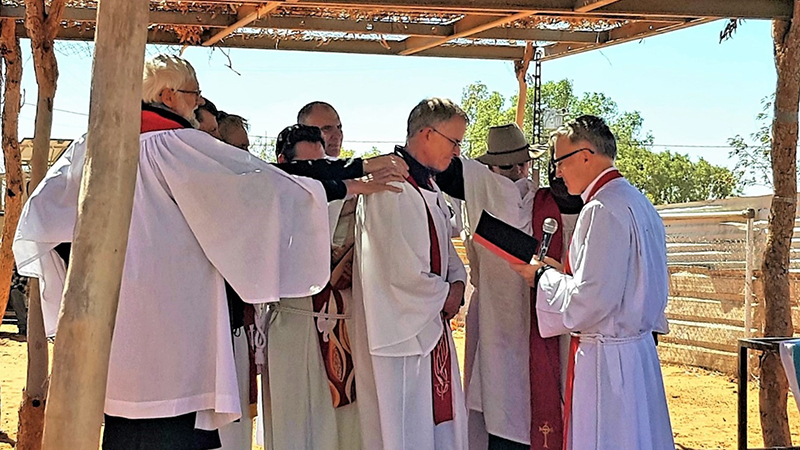 Also, last month former Alice Springs Aboriginal Communities Ministry Pastor Basil Schild was installed as College Chaplain at Yirara College.